Britain have named a full-strength team featuring several Olympic and world gold medallists for October's European Track Championships in the Netherlands. Women's team pursuit champions Laura Trott, Dani King and Jo Rowsell and fellow endurance winners Ed Clancy and Steven Burke are in an 18-strong squad. Jason Kenny, Phil Hindes and Becky James are chasing more sprint titles. 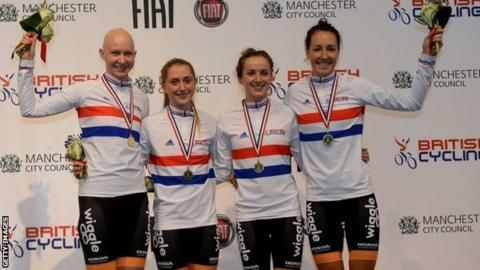 GB Cycling's Shane Sutton said: "We are sending a full team in preparation for [November's] World Cup in Manchester." The European Championships take place from 18-20 October in Apeldoorn. Trott, King and Rowsell, who have won world and Olympic titles as a trio in the 3km team pursuit, set a world record in the new 4km team pursuit with Elinor Barker to win the British title last week. The quartet are joined by Katie Archibald, 20, who is making her debut in the women's endurance squad while Jess Varnish, who won four sprint titles at the National Track Championships last week, is also in the team. British Cycling's performance manager Sutton added: "It's great to be able to welcome Katie Archibald to the team, and it's testament to the programme that we are able to continue to develop and expand our squad and introduce talented new riders. "It's the start of the season, so we don't know where we're at compared to the rest of the world at this moment in time. "However, we saw some strong results at the National Track Championships and we're looking to be in good shape as a team so it will be interesting to see how that stands up against some international competition."